home-brew computers, modules, info: Wilson Mines Co. 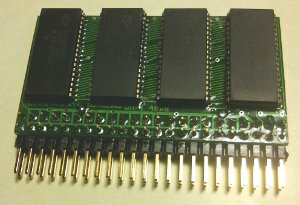 The first module is a 32Mb 4Mx8 5V 10ns SRAM module. Data sheet here. Email me at wilsonmines@dslextreme.com to buy. 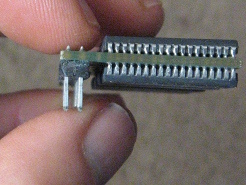 The module is 2.3" long, and is available with 90° pins (shown first, and it makes the module stand perpendicular to the mother board), or straight (shown second, and which puts it parallel to the mother board), or now also with rows at .300" spacing (shown third). Specify your preference when ordering. This is the densest, fastest 5V SRAM module that I know of, and its pin header makes it hobbyist-friendly. When fully populated, it has 64 times as much RAM as the Commodore 64 did, and 32 times as much as the original Mac did. Being SRAM, it is free of the complications of DRAM management requirements. There's more discussion of it on the forum here. 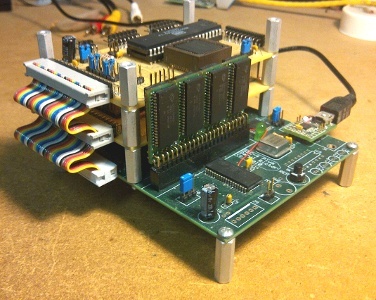 Daryl Rictor's SBC-4 computer which he sells (pictured above) uses it. I can provide the sockets too, both in soldertail (for $2.25 each) and in wire-wrap (for $5.50 each). The price has gone up and down (mostly down) with the price of the ICs, but probably won't get any lower now. I get the ICs in quantity from a Cypress distributor in the U.S. for less than half of what you would probably have to pay for just a few. A fully loaded module is $69+postage, +sales tax if going to a California address. (Add $10 if you want .300" row spacing, because of the extra labor involved.) Partially loaded modules are available for less. Easiest payment method is usually Paypal, to my email address, wilsonmines@dslextreme.com . Email me first. Postage to U.S. addresses now is $8 for USPS Priority Mail, $3 for First Class. Postage to other countries is somewhat higher, but low compared to the shipping prices quoted by many U.S. suppliers. People sometimes email me with fears that I won't be able to supply the module anymore because they saw that the Cypress chip is no longer available. Don't worry. What's happening is that Cypress occasionally makes slight changes in the process and puts a different suffix on the part number. The changes are insignificant to most potential users, although I was disappointed when they made it so you couldn't battery-back it anymore on the fleapower supplied by a coin cell battery for years. I expect to be able to supply the module practically indefinitely though. Jan 2019: I just noticed Cypress no longer has the CY7C1049D data sheet available (so the link in my module data sheet is dead too), and instead the version they're making is the CY7C1049G; so the next time I order ICs, that's probably what I'll get. I do order from a legitimate Cypress distributor in the U.S., not eBay and not China. Granted, 4MB or 8MB is not much storage compared to what comes in CF of SD cards; but it's quite a bit for a 6502 system where you won't be storing videos or doing photo editing and probably won't even be listening to music on it. 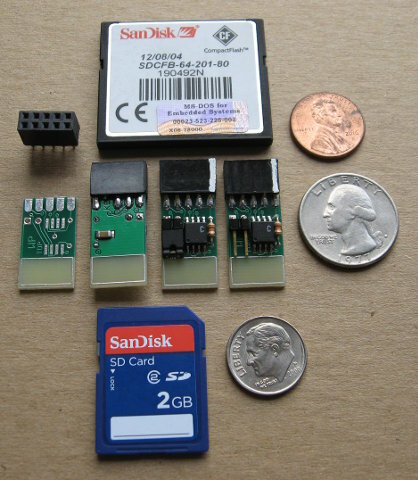 It's much easier to work with in terms of writing your own software drivers, and also cheaper than the standard consumer-electronics memory cards. You can make your own file system, or use them with no file system at all (as in my first use of one, for recording audio, in a loop). I have not yet decided how to price these. The price of the bare board will be well below that of the IC, probably even including shipping if it's to U.S. addresses. As for selling pre-assembled units: The amount of assembly time required is fine for small quantities for personal use, but if I assemble them for others, I'd probably need to charge more than they will want to pay; so I might just sell the bare boards, with an exception for the few customers who can't see well enough to assemble one, or have other limitations. As with any boards, a large-enough order would justify the set-up cost for automated assembly, reducing the price of completed modules. Email me to buy. And: I have 110 6512 microprocessors I bought in the mid-1980's for a project I never went through with, to make an inexpensive SBC for education, hobby, and light industrial applications. The 6512 is a 6502 whose Φ1 pin is an input rather than an output, and you would normally drive the Φ0 and Φ1 inputs using both the Q and Q outputs of a 74xx74. The 6512 also has a DBE (data bus enable) pin (pin 36). The data sheet says, "This input allows external control of the three-state data output buffers and will enable the microprocessor bus driver when in the high state. In normal operation DBE would be driven by the Φ2 clock, thus allowing data output from microprocessor only during Φ2." It also says this external-clock version is "geared for the multi-processor system applications where maximum timing control is mandatory." (It can be used in a single-processor system too though of course.) Make me a reasonable offer for some or all of them. I could sell them one at a time, but I prefer not to. Now that I've hooked up with a PCB manufacturer that is very inexpensive for small quantities, I expect to introduce more modules at a quicker pace in the near future. Goals for a home-made computer tend to quickly become too lofty to carry them out in your lifetime, or change faster than you can build. It helps to have various sections ready-made. The SRAM module above integrates up to eight fast SMT 512Kx8 5V SRAMs and the bypass capacitors on a small board with parts on both sides and a dual-row socket of 46 pins on .100" centers which is perfect for breadboarding (although if you breadboard, I do recommend using breadboard with a ground plane like Twin Industries,' 8100 or 8200 series for this high-performance module). This is not solderless breadboard, but the type used for wire-wrapping. I can provide the sockets. There's a brief write-up on how I got into home-made workbench computers, microcontrollers, and automated test equipment, with links, in my "Introduce Yourself" post, the first one in the topic. I am very active on that forum, and also have some articles on 6502.org. I have a similar write-up here on how I got into HP calculators as equipment controllers on the workbench, which influenced my own home-made workbench computer designs. Many more articles, plus show-and-tell of my own projects, are planned for this website. computer construction, tips, graphics, articles, even slide rules! added 2/17/15 6502 interrupts primer. I put it on 6502.org 12 years earlier, and it will remain there too; but it's much easier to edit on my own site. This website gets over 1000 page downloads per day, over 3000 files per day. The most popular section is the 6502 primer, followed by the section on 16-bit scaled-integer math and the large look-up tables. Many thanks to Andy Werner ("handyandy" on the 6502.org forum) who proofread virtually my entire site! page last updated Apr 11, 2019 contact: Garth Wilson, wilsonmines@dslextreme.com (southern California) Please, no SEO spam!